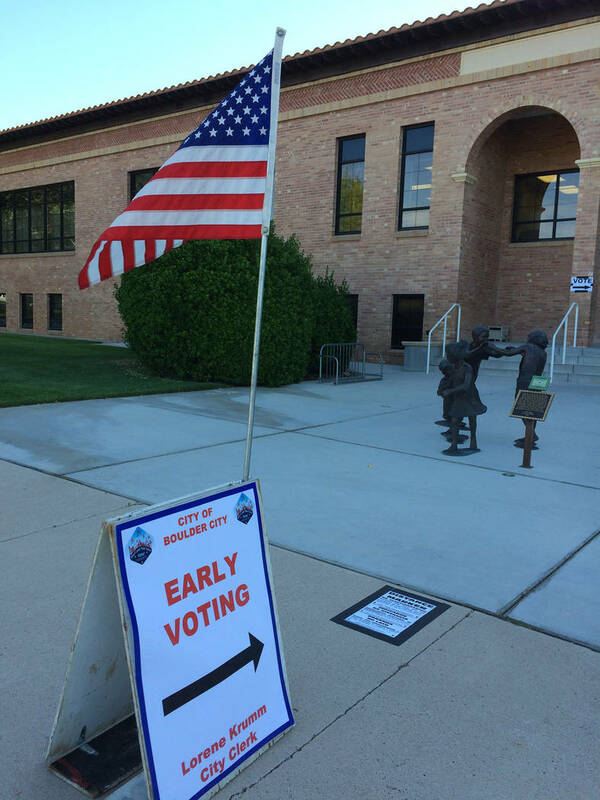 Early voting for Nevada’s general election started Saturday, Oct. 20, and continues through Friday, Nov. 2. Early voting for the general election Nov. 6 starts Saturday, Oct. 20, and goes through Friday, Nov. 2. Registered voters will be able to cast their ballots in Boulder City from 7 a.m. to 6 p.m. Monday, Oct. 29, to Wednesday, Oct. 31, at City Hall, 401 California Ave.
Boulder City residents can cast their votes locally from 7 a.m. to 6 p.m. Monday, Oct. 29-31 at City Hall, 401 California Ave. All registered voters can vote early at any polling center in Clark County. The general election is Nov. 6 and will select the Democratic, Republican and nonpartisan candidates who will represent Nevada at the local, county, state and federal levels. And voters will weigh in on several ballot questions affecting the state and Boulder City. The local contested position on the ballot is the Boulder City justice of the peace seat. Incumbent Judge Victor Miller is being challenged by attorney Rob Martin. Steve Hampe is running unopposed for the Boulder Township constable position. Voters also will be asked to weigh in on several local issues, including whether the city should buy a new fire engine, refinance its debt, restructure use of its enterprise fund and issue bonds to finance a remodeling of the library. Also, several Boulder City residents are running for positions affecting town. Former Planning Commissioner Glen Leavitt is running for State Assembly District 23 against Independent American Ralph Preta. Resident Amy Carvalho is running against Andrew Coates for the District 12 seat on the Nevada Board of Regents. The seat for State Senate District 12 has Boulder City residents Democrat Gary “Craig” Jordahl and Republican Joseph Hardy vying for the post. Clark County Clerk Lynn Goya, a Democrat, is seeking re-election and is being challenged by Republican Minddie Lloyd. Goya is a Boulder City resident. Other positions representing Boulder City to be determined in the election are a U.S. Senate seat, the Representative for Congress District 3 and Clark County Commission District G.
A list of early voting locations can be found here: www.clarkcountynv.gov/election/Documents/2018/EVSched-SamBal-18G.pdf.